Through heat waves and thunderstorms, exams and summer holidays there is one constant in our life, one thing that keeps us going and provides the support we all need. That constant is, of course, Gentry, and this article will be summing up what we can look forward to in the weeks and months to come. We will tackle the leaderboards and Invitational, the GentryBQ and the Open, and… a little teaser of other things to come. Before we set off, lets make sure we have the basics. Before we dive into the good stuff; before boarding our hype train and looking forward to all the beautiful destinations we need to look at the basics: What is Gentry? Gentry is a budget version of Standard, a Constructed format in Magic: the Gathering. That is a lot of words bearing a meaning that some of you might not understand, so I will explain them starting from the back and working myself to the front of the line. If you understand everything in that line, just skip to the last paragraph to get an idea of what Gentry is. Magic: the Gathering is a collectible card game that has been growing since 1993. 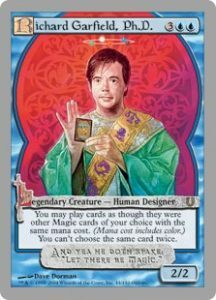 Richard Garfield, its spiritual father invented the collectible card game concept that many have tried to imitate but so far have not met, depending on how you look at the numbers. It has a classic fantasy setting in which players are battling it out summoning armies of intimidating creatures and slinging powerful spells at each other or their armies. Each player brings their own deck of at least 60 cards selected from the pool of available options, taking into account there is a 4 copy per card maximum. A format is a way of playing the game that limits the number of cards you are allowed to play with. This evens the battlefield by restricting the older cards in most events so card availability is less of an issue in building your deck of cards. 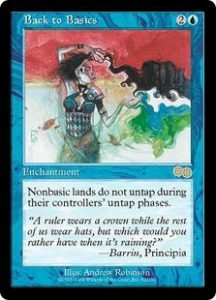 Constructed is one of two kinds of formats. It means you bring your own cards to the event. This is the opposite of Limited, the other kind of format, in which you are given a random pool from which you need to build a deck on the spot. Standard is a Constructed format (see, we are learning, this makes sense now) that limits the card pool to cards released since September two years ago. It is one of the most played formats since it only features the sets that are still being printed and thus should be easy to find. A ‘budget version’ refers to the cost of playing the game. There is a vast secondary market that spreads the cost of packs of cards over the single cards that come out of it based on demand. Since tournaments drive these demands, the cards that are played in Standard greatly dictate which ones are more expensive than others. This causes most competitive Standard decks to easily reach several hundred euros in value. Gentry aims to reduce this cost by imposing addition restrictions on what you are allowed to play. Finally we arrive at the beginning of the sentence, Gentry. In our format we limit the amount of rare cards you can play to 4 per deck and the number of uncommons to 15 per deck. In addition, the 4 rares have to be different. These rules make it so that most competitive decks in Gentry fall under 20 euros in costs and a lot of cards and strategies are playable that aren’t in “regular” Standard. There are monthly events in Ghent and Bredene that award points to the leaderboards. In these players vie for top spots for varying reasons you will read about later on in this article. The big news here is that it took a while to figure out how the ‘tables’ function on the new website works and, well, I finally did and was able to post them. A big shoutout to Niels Vandevelde is warranted here, who managed to go undefeated so far and has a lofty lead in the Ghent Leaderboard. In Bredene we have Tom De Wael in the lead, easily the most experienced player in the entire board, chased closely by new talent Amaury Henneaux. Lets see who eeks out the win in the end, veteran or fresh blood? 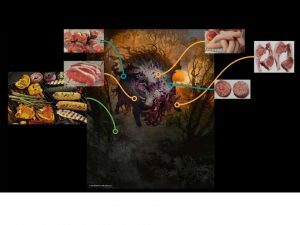 The League of New and Beginning Magic Players (the birthing place of Gentry) is hosting their first social event and have chosen to make it a BBQ. You can find more here. Important to know is that you are only entered in the bbq when you make the bank transfer and send the e-mail, clicking on “going” does nothing. In the evening there is also a Gentry event that 8 specific players might find somewhat more interesting than to others. The Gentry event will be the regular cost, set-up and prizing, costing €10 and starting at 19:30. You don’t need to join the BBQ to join the Gentry event, so cherry pick your combo. The Gentry Invitational is a showcase event in which 8 selected players play in a single elimination event to win a bye for the Open that follows it. All 7 of these matches are played on camera and receive commentary. This event takes place in Outpost Ghent and also features side events for visitors, spectators and eliminated Invitational players. Draft, Rare Draft and 4 player Gentry Round Robins are possible. But who are the lucky few that are selected? 1. The Winner of the last Open, Alan Scheur, is the only one who has a spot so far. 5 – 6. The Top 2 of the Gentry Leaderboard in Bredene after the August event. In the beginning of August, after the leaderboard slots become known, We will announce a way to both offer someone for election and vote for them. Keep an eye on the facebook page for the announcement. 8. The mighty overlord slot. I will personally select an 8th person to be included in the event. This person will be selected based on their deckbuilding skills, position in the Gentry community and even on the number of votes they get in the community vote. All of this, the leaderboards and the Invitational, leads up to our big showcase event of the season. Twice per year the League hosts this event, the only event that is judged at a competitive rules enforcement level and features a matching prize structure. We are currently re-evaluating the payout to allow for more people to get prizes and we are looking into sponsors as well. As some of you may remember we had an insanely nice goodie box for all players last time and we aim to match it again this time around. Everyone in first place in any leaderboard gets a bye for the Open. In case your community currently does not have a leaderboard but plays Gentry regularly and you have players interested in going to the Open, you can still contact me to open a Leaderboard. To get the approval you will have to host events in July, August and September (three months is the minimum for a legit leaderboard). There will be feature coverage and it will be the best value event the League hosts all year. For now, mark the date and look out for more information closer to the event. Niels Viaene came into contact with Magic first through the Kazz & Zakk starter set in 1996, but it wouldn’t be until 2000, around the time Prophecy came out that he actually started playing magic thanks to his nephew. Niels’ Magic career has been a roller coaster up to now, including Grand Prix Paris 2009 top 8, Pro Tour San Diego 2010 top 8, becoming a L3 Magic Judge in 2015 and managing the community effort that is the League of New and Beginning Magic: the Gathering Players, the birthing ground for Gentry since 2012. All this comes from a deep love for the game that is far from diminishing.